Looking to move to the Cardinal Estates area in Virginia Beach? Super! Here are the Cardinal Estates homes for sale! Cardinal Estates is a nice quiet neighborhood near the intersection of of Lynnhaven Parkway and Holland Road. There are limited entrances into the neighborhood which limits through-traffic. The front of the neighborhood empties out at Shipps Corner Road near Shipps Corner Shopping Center. The back of the neighborhood connects withScarborough Square neighborhood. 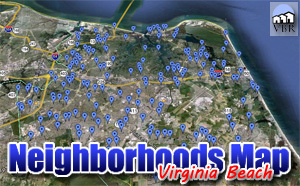 Nearby points of interest areLynnhaven Mall, Lynnhaven Golf Park and NAS Oceana. Other nearby neighborhoods are Magic Hollow,Buckner Farm and Oak Springs. The homes in this area are in the Landstown school district. We have a page with all the homes for sale in Cardinal Estates. Click on this button to see everything currently listed there. When you find a home you would like to see, please let me know! Call (757)589-1237 and I will arrange a showing! Or, on the property, complete the Find Out More form and click submit. I will get information to you right away!